Reformed Outfitters serves you by providing resources to learn about the gospel, love God, and live out Jesus’ redemptive work in your life. We developed a mobile application so that you have great resources with you wherever you go, in a great package you can share with friends. Use this application to access Sermons, Meditations and Leadership Resources as well as Psalms, Hymns, Creeds and Confessions of Faith from the Canadian and American Reformed Churches. After you’ve downloaded and enjoyed the content, you can share it with your friends via Twitter, Facebook, or email. An internet connection is required for full functionality. 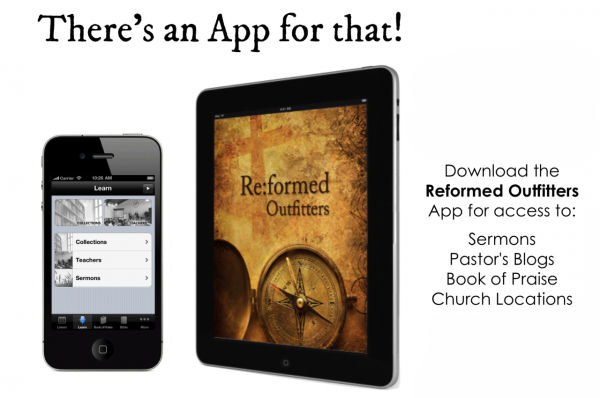 The Reformed Outfitters’ app framework was developed by Subsplash. A huge shout out to them for their support!